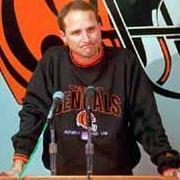 Will never forget the magic of the season he led the Bengals to their first Super Bowl !!! I liked the part of his life when he started a shrimp company and ran across the county for three years. Remember his SuperBowl year here, and when he was hired (was around 10-11 yrs old), RIP, along with Wyche, one of the only great Bengals' coaches. Thanks for the AFC Championship.